Tomorrow is the official start to Spring Break in our school district! I love having my boys home with me during the day, so the 6 days they have off are going to be great. I decided that I was going to make them a special treat to enjoy their time off! 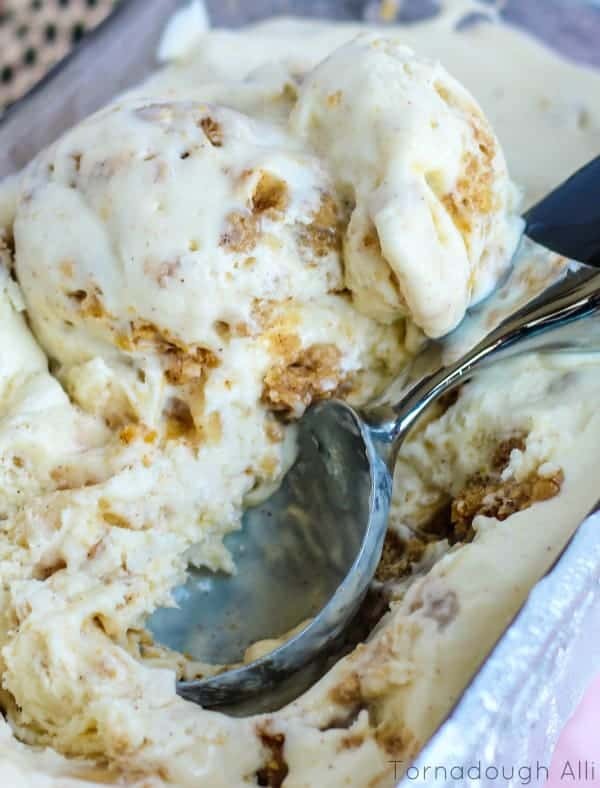 My boys are huge ice cream lovers, as well as my husband so I whipped up a batch of this super easy Apple Crisp No Churn Ice Cream. We are huge lovers of ice cream in this house and the best and easiest way to make it is the no churn way. I mean we have an ice cream maker, but the process is longer than we like and I mean if we can have something that mixes together quickly and is ready in 4-6 hours then why not! No churn ice cream is super simple and technically contains about 3 ingredients if you want to get down to the basics. Heavy whipping cream, sweetened condensed milk and some vanilla. Where you go from there is up to you. There are so many variations it isn’t even funny. OK, I’m going to give it to you straight. This ice cream is absolute heaven. Apple Crisp alone is a dream, add it to ice cream and you take it to a whole nother level for sure. Vanilla ice cream, spiced with a little bit of cinnamon and laden with gooey and crunch chunks of Apple Crisp. Yup, that is my dream description right there. Sold! 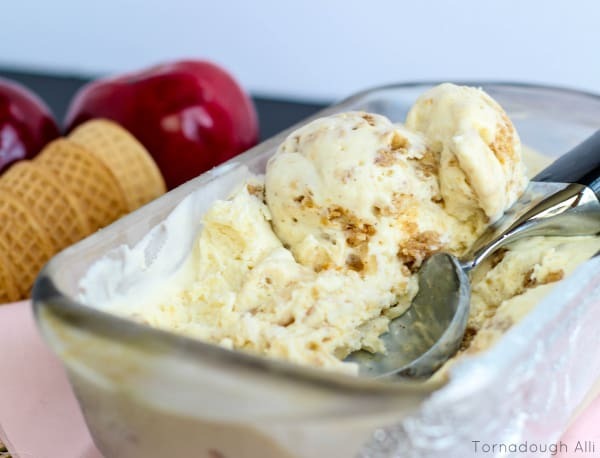 We cant get enough of this Apple Crisp No Churn Ice Cream, we make it every year because we usually have an abundance of apple crisp (my husband always asks me to make batches and batches of the stuff) and what better way to take a twist on a classic? 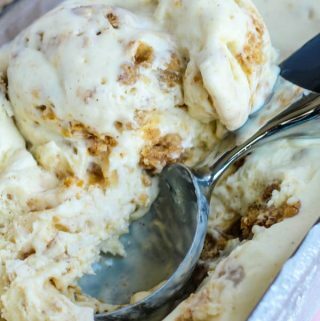 Once you try this ice cream you will never want apple crisp another way…But technically speaking you usually eat apple crisp with a side of ice cream so it only makes sense to put the apple crisp directly into the ice cream itself right? See I was thinking on this one! 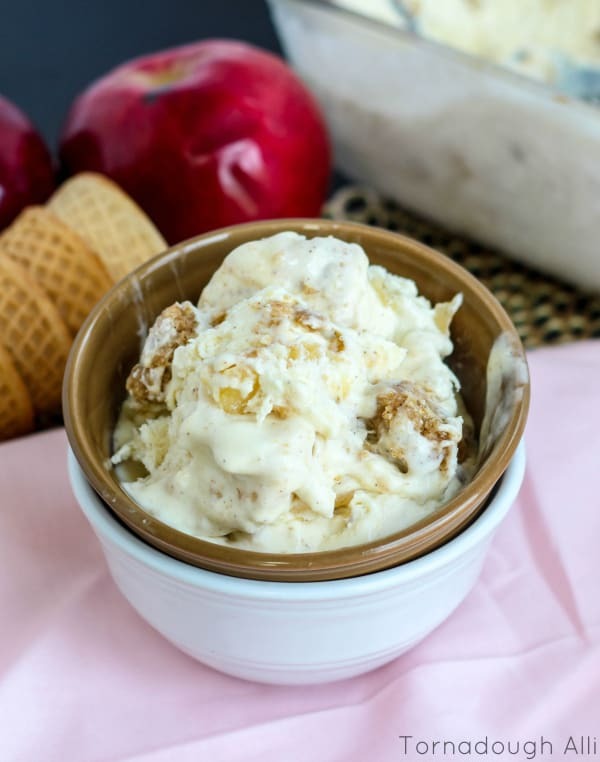 Save yourself some guesswork on what kind of ice cream you want to whip up and run now to make this Apple Crisp No Churn Ice Cream, I’m confident that you will fall in love just like my family! If you like this recipe you’ll love this Monster Cookie Ice Cream, Chocolate Malt Crunch Ice Cream and this Lemon Poppyseed Ice Cream! To make apple crisp, in bowl combine your cake mix, oats, brown sugar and cinnamon and stir to combine. Add your melted butter and stir until crumbs form. In a 9 inch pie plate spread your apple pie filling on bottom, top with your filling with the crumbs. Place in oven and bake for about 30-40 minutes or until golden. Once cooled to make ice cream start by beating your heavy cream, vanilla and cinnamon on high until stiff peaks form. Chop up about half the apple crisp (yay more for you to eat later) into cunks and sprinkle into the ice cream mixture and stir. Pour mixture into a 9" x 5" bread loaf pan and cover with tin foil and freeze for at least 6 hours or until frozen. There will be leftover apple crisp so just enjoy! Thanks! Super simple and seriously delicious. Looks yummy and also no need to use an ice cream maker!! Bonus! Right! Easy peasy, just how this girl likes it. 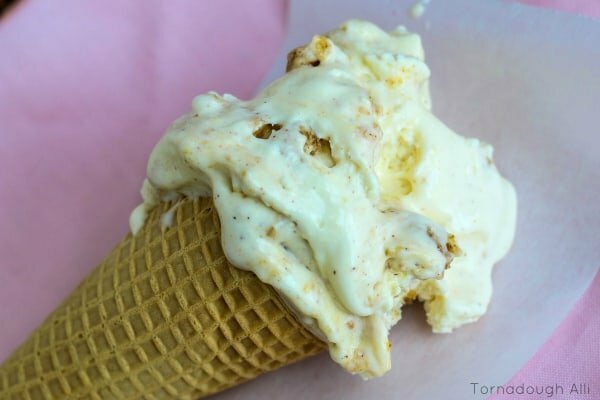 I love a freezer ice cream recipe and this one looks extra delicious! Thanks!! So easy to make, I can’t quit! YUM! Ice cream is my weakness. THIS looks absolutely sinful! I love how you changed up your blog. It looks awesome! Thanks so much Michele. I adore the new look, suits me better. And you’re so right on the ice cream. Looks SUPER_DELICIOUS !! We love everything with apples, and together with the ice-cream = YUMMY !! Thanks Winnie. This ice cream is seriously delish! Pinned and shared. Thanks for linking up at #OverTheMoon! I hope you will join me at #ThursdayFavoriteThings! This would be great to share at Recipe Share Party on Thursdays.we pin and yum everything! I love crispy bits in my ice cream so I’m filing this for a time when I can afford a few extra calories. Like August. Thanks for linking up at #SaucySaturdays, Alli. Hi Alli! Just stopping by to thank you for sharing your awesome Apple Pie Ice Cream at Weekend Potluck last week. We hope to see again this weekend – the party has already started! Have a great weekend!